I felt a lot better just by writing my last blog, crying to the Lord. I saw two clear answers for my agitated heart. 1. Beg for a service which is inconvenient for me at the local temple. 2. Beg to the Srila Prabhupada at his samadhi at Vrindavana to show me the way. Next day, 29th, as I was getting ready to go to the office my morning meeting got cancelled and then the afternoon meeting too got postponed and suddenly I smelled a golden opportunity to go to Dhama for a day. I left for the Vrindavana at 11.30am. It was all empty roads on a hot summer day. I realised this is the best time to listen to some nice lectures and as I was browsing though my list on phone I saw the recorded lectures of Govardhan Retreat by HG Bhurijan Prabhu and HH Sacinandan Maharaj. It was a coincident that I haven’t heard this series since many months ( I listen to them regularly). The recording started with initial introduction to Govardhan retreat by HG Bhurijana Prabhu. Prabhuji then explained various wonderful pastimes of Krishna at Govardhan and then HG Madhavananda Prabhu spoke for half an hour on more pastimes of Krishna and then it was time for lecture by HH Sacinandan Maharaj. The next 1.25 hours were sheer bliss by listening to Maharaj. I am quoting a small portion of the lecture, which I noted on my mobile while listening. I have realised that I only absorb and remember those lectures which I hear repeatedly or those which I share with devotees or those for which I make notes. The highest being when I share it with devotees, in that case too I remember only 20-30% of what I like, unless I share it with more devotees. My dear mind, the despicable desire for material honor and distinction is compared to a shameless dog-eating, low-born prostitute- yet she is flagrantly dancing in my heart. 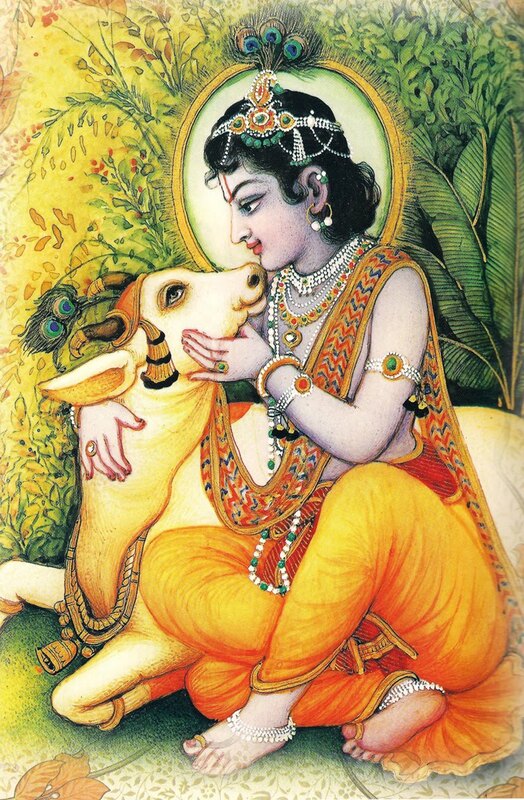 How, then, can the pristine love of pure devotion to Sri Krishna even find a place in my heart ? You will simple have to serve the unalloyed devotees of the Lord, who are his intimate associates and stalwart supporters. They alone can drive out this prostitute and enthrone pure love of Godhead within my heart. it is not for the recognition of others that we should our bhakti, it is for the recognition of Krishna. This is what we want, not that we are recognised as something special and something good. We want that Krishna is recognised. What wonderful lines and realisation for me. I never ever thought like this before. I aspire to become a good devotee and a good disciple but never thought for a single second that I am doing my bhakti for the recognition of Krishna, which means consciously or unconsciously I am doing my bhakti for my ownself, my own fame. Maharaj explained that `pratishtha’ is like poison and if we swallow it then ufff ! it will destroy you from inside. Maharaj added that whenever fame comes to us, as we do some good service, and we generally say this is all due to the mercy of my Guru Maharaj. Maharaj said don’t say such words because we want to be known as a very good disciple, say it because we should feel (and say) that on my own I am not good for anything and whatever good is there it is because someone else gave it to me. What is the solution ? One should serve those who are dear to the Lord. Only a pure devotee of the Lord can throw out this `witch’ of fame, and her associates, who are in our heart, and then bring the great king of love, Krishna, on the throne of our heart. I pray at the lotus feet of HH Sacinandan Maharaj and beg him to bless me that I always remember this one line and do my bhakti only for the recognition of Krishna. All glories to HH Sacinandan Maharaj. 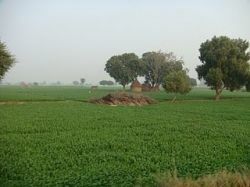 After I took the left turn from the highway for Sri Radha Kund, and passed through villages, there were lush green fields on both sides. 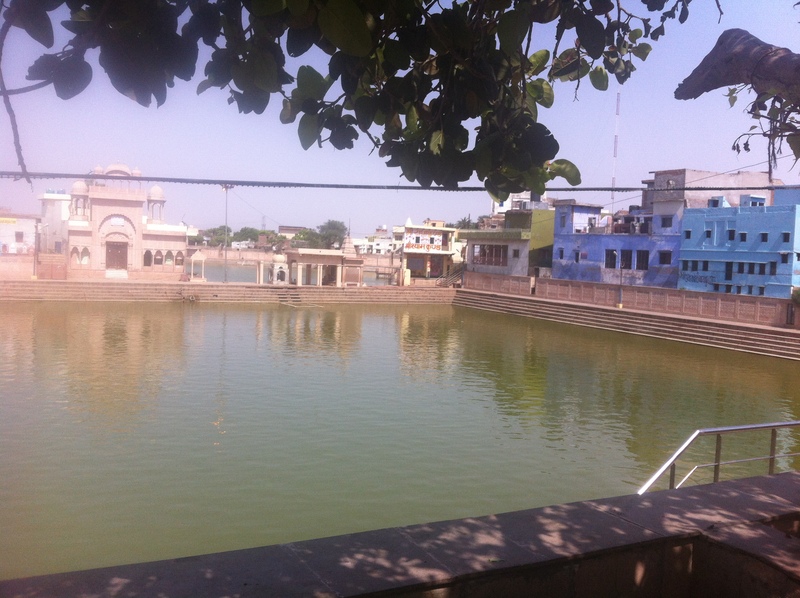 I reached Sri Radha Kund around 3 pm. We drove right till the Radha Kunda, as the market and the lanes were deserted. I got down from the car a local panda (local priest) arrived from no where, probably the car acted as a cue. The road outside was so hot that I could not walk a single step barefoot. I entered Sri Radha Kunda, paid my obeisances on the steps and then took bath in the shaded portion of the Kunda. The water was surprising not at all warm. I paid my respects, seek forgiveness for entering the holy water, being completely unqualified, I shared what all was agitating me and then I prayed with all my heart to show me a way. After the bath, the panda `cajoled’ me to offer arti and made me donate some rice and dal as today was `amvasaya’. I requested him that I needed the pictures of Sri Radha Kund and Govardhan and the panda helped me by taking me to a shop and I found just the right picture and size for my altar. I was so happy to see these pictures that I wanted to hug the panda. I was looking for them since last one year and could not get them anywhere. HG Vidurpriya Prabhuji had told me earlier that They will come when They want to and not when I want, so today They agreed. Sri Radha Kund ki Jai ! I had earlier planned to visit only Sri Radha Kund and then go straight to Vrindavan but after listening to the retreat lectures, and now getting a beautiful picture of Giriraj, I felt inspired to pay my obeisances to Sri Govardhan. 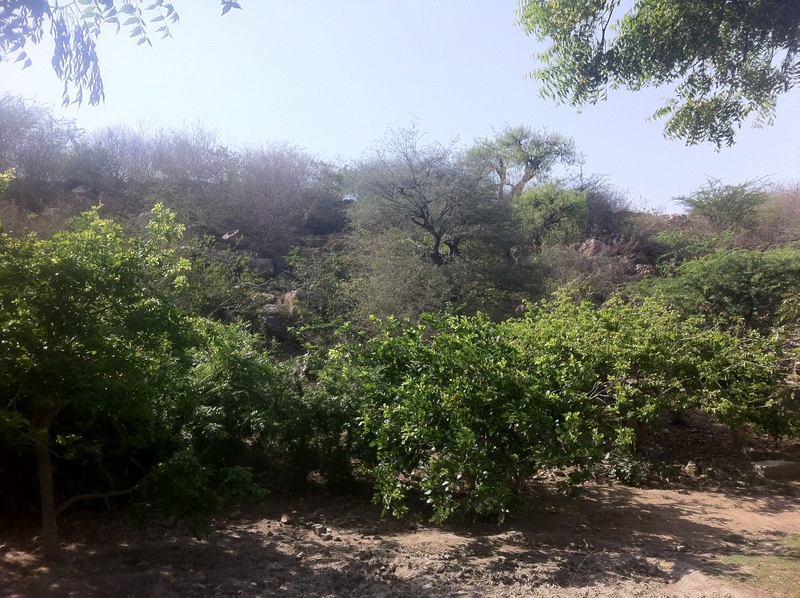 I told the driver to go to Govardhan, we drove till the main market and then took the left turn. And there He was, an effulgent and majestically standing Govardhan. I filled my eyes with His beauty, paid dandavat pranam, thanked Him, and left for Vrindavan with Vraja dhooli on my forehead. I had a quick lunch in the car, which my wife had packed for the office. By the time I reached the temple it was almost 4.25 pm. I bought a pair of rose garlands for Sri Krishna Balram and entered the temple. Whenever I enter Sri Krishna Balram temple it is an indescribable feeling. It is like coming back to my real home, or as I have shared earlier, coming back to the home of my grandfather. I know someone is waiting who loves me, without judging me, or I may add, someone who loves me despite knowing who really I am. As I entered inside, a soft melodious kirtan was going by the 24 hour kirtan party. I first paid my obeisances to Srila Prabhupada, thanked him profusely for inspiring me to come here and begged him to engage me in his transcendental movement. And after paying dandavat at the closed altar I went and met HG Ganshyam Prabahu, who was part of the Kirtan party. He is a very simple and sincere devotee who serves HH Janananda Maharaj. I gave him the parcel which HG Shyam Sundar Prabhu had sent for him. Suddenly the conchshell blew and it was time for Their Lordship to see us. The beauty of Deities at Vrindavan is beyond words, They always look so fresh, so beautiful, so stunning, so captivating, so charming, words fail to describe Them. After paying my obeisances and thanking Them for letting me come there, I stood there admiring Their beauty, alternating between all the three altars, each one more munificent, more sublime and simply divine. The kirtan was now going on with more vigor. A hall which was empty 5 minutes back was full of dancing devotees. As I came into the temple courtyard I saw devotees doing the service for rubbing chandan for the chandan Yatra. HG Ganshyam prabhu came out and graciously got me some mahaprasadam. He saw me looking at the devotees who were doing the service of rubbing chandan and he asked if I would like to do it ? My heart jumped and I said Yes please ! He went to the Prabhuji who was in charge of the service and requested him to allow me to do the service for sometime. Prabhuji asked my credentials and whether I am following all the 4 regulative principles strictly and chanting my rounds, and after my affirmative answer Prabhuji allowed me to take up the service. I was so delighted as I could get a direct service for the Lord. I didn’t sit idle for a single minute today, what a good fortune, all mercy of Mahaprabhu, Srila Prabhupada and the devotees. 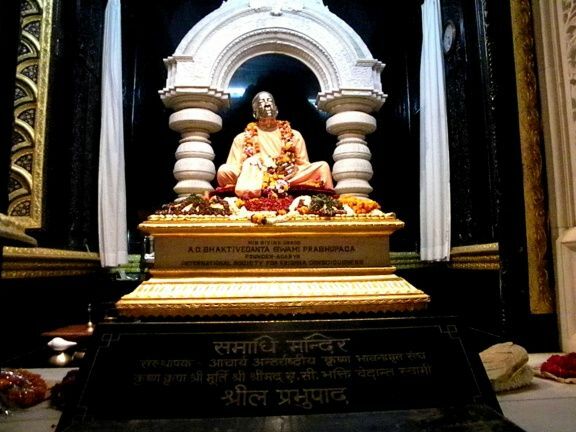 Later, I went to Srila Prabhupda’s samadhi and thanked him again for inspiring me to come to Sri Vrindavan dham and sought his causeless mercy to engage me in his movement and begged for intelligence to serve his servants and their servants with all my heart and without any prejudice. I wanted to cry at his feet but no tears came out of my dry stone like heart. I left the temple around 5.50pm to meet HG Damodar Prabhu, a very knowledgeable and yet a very humble devotee. I reached his home at 6pm and spent 30 wonderful minutes with him. After initial greetings I asked Prabhuji how can I read Caitanaya Caritramrita better and learn to recite the Bengali verses. Prabhuji instructed me that I should not just the read the translation, which is what I do, but also read the verses, even if I can’t pronounce them properly. Prabhuji said that there is no difference between Sri Caitanaya Caritramrita and Sri Caitanya Mahāprabhu and whenever I read Caitanaya Caritramrita I must first pray to Mahaprabhu and if Mahraprabhu is pleased then reading and reciting Bengali verses would suddenly become a cakewalk. Jai! When Prabhuji had last come to Gurgaon, he had sung `Hari Haraye Namah Krsna Yadavaya Namah’ and `Bhaja re bhaj re amar mana ati manda’ bhajans. These two bhajans remain firmly imbibed in my heart for the melodious and absorbing way Prabhuji sang them. He had literally taken me to the transcendental world while singing them. So my second question was how can I learn to sing Vaishnava Bhajans as I have developed a longing to learn them but I do not have any musical sense or voice. Prabhuji smiled and replied that to sing Vaishanava bhajans we do not need to be an expert in tunes or require any special singing skills as they need to come out from our heart. When I said that in my case the heart also does not have any feeling or purity, Prabhuji told me to pray to the goswamis and practice them everyday and I should get them. He also told me that I can listen to bhanjans by Sri Akinchan Krishnadas Babaji Maharaj, Srila Prabhupada’s godbrother, who used to chant almost 24 hours a day and hear how by simply playing a basic kartal tune and with a not so melodious voice he still takes the listener to another realm by his simple bhajans. I promised myself that I am going to learn few bhajans, which I can sing alone in my coarse voice and see if I can glorify the Lord. I left his association around 6.30pm for back to Gurgaon. This short trip proved to be one of my best trips as by the mercy of the Lord I could absorb most of the time remembering Krishna, listening about Krishna, got darshan of Sri Radha Kunda, Sri Govardhan, Deities at Krishna Balram temple, goy to do the chandan service for the Lord and then got devotee association with HG Ganshyam Prabhu and HG Damodar Prabhu. I spoke to HG Shyam Sundar Prabhuji for sometime and then chanted almost all the way back to home. My agitated heart was calm, filled with love and an increasing inspiration to do something more in the service of Krishna, Srila Prabhupada and Guru. All glories to Sri Vrindavan Dhama. All glories to Sri Guru and Gaurnaga. This entry was posted in My realisations, My spiritual Journey and tagged Bhurijan Prabhu, Chandan yatra, Giriraj, Govardhana, HH Sacinandan Maharaj, Krishna Balram temple, Krishna Consciousness, Krishna devotees, Madhavanada Prabhuji, Mercy of Dhama, Radha kunda, rubbing chandan for the Lord, service in Krishna consciousness, singing bhajans, Srila Prabhupda, Vaishanava Bhajans, Vrindavan. Bookmark the permalink. Thank you for liking the blog and leaving your comments. Inspite of being born with zero intellect to even contemplate, leave aside writing, by devotee’s mercy I am somehow able to pen these thoughts. I beg you to please be a critic as well and guide me on how to write better for the pleasure of Lord and His devotees. Thank you for the blog. Just remembering Vrindavana is so purifying. But, I have one small botheration. The holy place known as Mathura is spiritually superior to Vaikuntha, the transcendental world, because the Lord appeared there. Superior to Mathura-Puri is the transcendental forest of Vrindavana because of Krishna’s rasa-lila pastimes. And superior to the forest of Vrindavana is Govardhana Hill, for it was raised by the divine hand of Sri Krishna and was the site of His various loving pastimes. And, above all, the superexcellent Sri Radha-kunda stands supreme, for it is overflooded with the ambrosial nectarean prema of the Lord of Gokula, Sri Krishna. Where, then, is that intelligent Person who is unwilling to serve this divine Radha-kunda, which is situated at the foot of Govardhana Hill? Knowing the super excellent position of Sri Radha Kunda, I shall never enter it with my filthy body. I shall only sprinkle few drops of its water over my head. Many may jump into it thinking it will purify. But, what really needs a bath is our filthy soul and not our body. The great Sanatana Goswami himself obstructed Mahaprabhu while He wanted to embrace him. We are not even remotely close to his high stature, and we think its alright to enter Radha Kunda that is the embodiment of Srimati Radharani’s love for Krishna. Hare Krishna Prabhuji. PAMHO! AGTSP! Prabhuji the way you are explaining your experience it show that you are a great devotees of Lord Krishna and I pray from the Lord Krishna to give you the space in his Lotus Feet.